Water is one of the world’s most pressing challenges. Faced with the opportunity to find better water solutions for global stakeholders, the Earth Genome, backed by the World Business Council for Sustainable Development (WBCSD), enlisted the help of Blue Raster and Arizona State University to create the Green Infrastructure Support Tool (GIST). 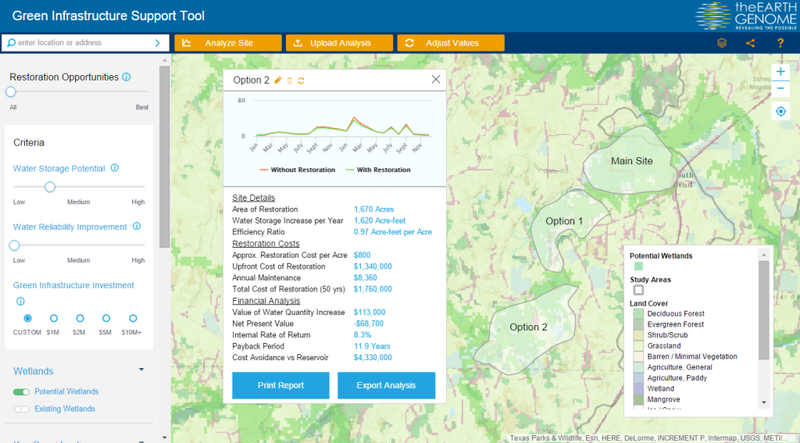 The interactive web mapping application provides high-level wetland-restoration site analysis and portfolio prioritization to address water scarcity and was recently launched at GreenBiz 2016. The tool employs criteria-based screening via spatial data and end-user inputs, enabling end users to weigh options across the region and compare relative value and costs. Financial metrics include net present value, area cost curves, and environmental return on investment. Together, they help determine the best “bang for buck” restoration sites to provision water across an entire basin. The application combines environmental data such as wetland areas, biodiversity and land cover with business initiatives that consider both investment and costs for various land-cover restoration options, resulting in a truly spatial decision support system. Key in the development of GIST was the ability to present data in an easy-to-use way and to incorporate millions of points of disparate environmental data. As a result, corporations, governments, water authorities, resource engineers or anyone interested in potential water restoration are able to create their own development sites with corresponding financial analysis. 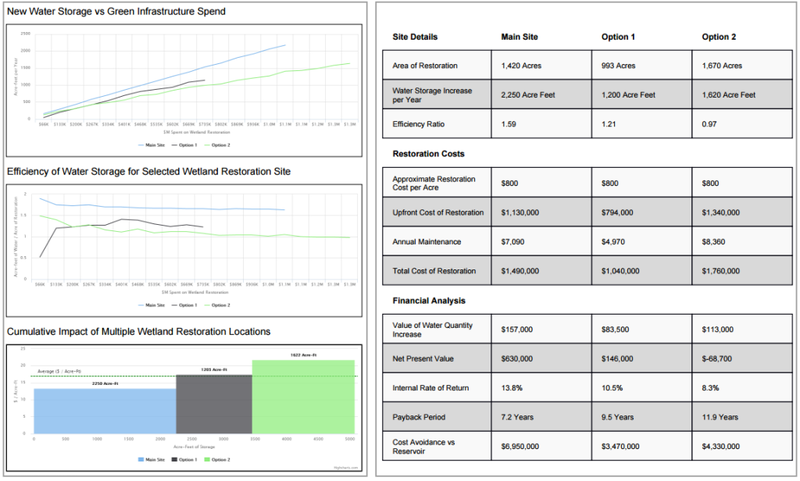 The reporting engine supports comparing multiple sites, determining the optimal green infrastructure investment, based on landscape characteristics and hydrologic modeling.